It’s actually quite easy and relatively cheap to make a tomato sauce that’s better than anything you’ve ever had from a jar. Since super-fresh produce is hard to come by this time of year (at least in New England) there are certain foods that help to fill in the gaps as we await the thaw. 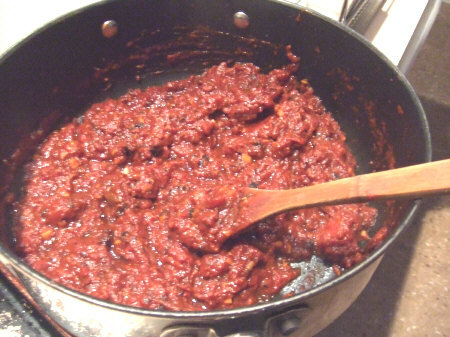 A good tomato sauce is a great for coating pasta or spreading on pizza, and it’s a multi-purpose way to spruce up vegetables or soups or even sandwiches. And this is a case of maximizing what’s available in winter, as canned tomatoes do a better job (for this recipe) than fresh anyway. I learned to make sauce very early in my cooking “studies” and I have only had to make minor adjustments in the years since then, thanks to a couple of basic principles that my older brother Matthew taught me in the summer of 1993 in a life-altering hour in the kitchen. 1) Especially for something this simple, good ingredients beget good results. There are few ingredients in a tomato sauce, so it stands to reason that there is no magic formula for making it good unless those component parts are of acceptable quality. You don’t have to necessarily use organic tomatoes (though I do and it surely tastes better), but the difference between the $2 can imported from Italy will most likely taste better than the 50 cent generic brand. If you use the finest tomatoes available, that’s the only way the cost is greater than that of pre-made sauce, but that’s assuming you’re comparing to low-quality pre-made sauce, which is essentially a whole different animal. Just use good olive oil and good tomatoes. 2) Cooking for a good while is important. There is a certain acidity to canned tomatoes (I’m inclined to just call it “canned tomato taste” and most of you will know what I mean) that goes away if you cook it for long enough. This doesn’t really require any extra effort, but it does necessitate thinking far enough ahead to start early and give yourself adequate simmering time. Add to this another principle I learned nearly 10 years later from Seth Bloom, a brilliant circus performer who is now co-leader of the Acrobuffos (click here to check them out – unrelated to food, but it’s super-cool). People generally add sugar to combat the acidity of the tomatoes, but in addition to sufficient cooking time, throwing in a chopped carrot or potato can absorb that acidity equally well. His suggestion was to add large chunks (and simply remove them and eat ‘em separately when you’re done with the sauce) but I like to add smaller chunks and incorporate them into the sauce. Either way is cool. Once you get the hang of it, there are tons of variations possible – the recipe is simple, though, to help you get the basic technique and to see how satisfying it can be as-is. This recipe makes enough to coat about a pound and a half of pasta generously (or 2 pounds more stingily and/or accompanied by other things) or to just have around as a multi-use thing for up to 2 weeks in the fridge in a well-sealed container. – 2 cans (28 ounces each) of tomatoes – ideally a mixture of textures (e.g. 1 crushed and 1 ground or 1 pureed and 1 whole peeled, crushed by hand as it’s added to the pot). 1) In a sufficiently large pot, heat up the olive oil over medium-high heat. 2) Once hot enough that a drop of water flicked into the oil sizzles immediately, add the garlic and stir constantly for about 1 minute, until fragrant and very slightly brown. Then add carrot and sauté for another minute. 3) Add the tomatoes, standing back to make sure you don’t get splashed. Add salt and a generous amount of pepper. Stir together, turn heat down do low and cover pot. 4) Simmer, stirring occasionally (maybe every 10-15 minutes) for about an hour. You can get away with as little as 30 minutes, but the more the better, up to 90 minutes. 5) Remove from heat and taste for salt and seasonings. You can serve right away or, better yet, let sit for an hour before serving to let the flavors meld. Believe it or not, this sauce tastes better reheated the next day. * Finely chop an onion and add to the oil first, sautéing for 5 minutes before adding the garlic. * Add the garlic cloves whole and remove them before adding tomatoes. You can eat them or dispose of them, but the garlic flavor will embed itself in the oil (this is a good option if for whatever reason you don’t want any chunks). * Instead of the carrot (or in addition, if you like it sweet) add 1 Tbsp of sugar with the tomatoes. * Add up to a tsp each of oregano, dried basil and/or thyme. And if you have fresh basil, add it liberally (chopped) right at the end, once you’ve removed the sauce from heat. I NEED TO REAN MORE ABOUT TOMATO SOS MAKING. AM IN DODOMA TOWN.